Islander joined the local cake club where members meet monthly to share tips and techniques on decorating cakes, cookies and other confections. Her cake decorating skill level is intermediate, but she is inspired by the more advanced members who make masterpieces. To share her hobby of cake decorating with our blog readers and her fellow cake club members, Islander has posted a pictorial below on how she made a lemon buttermilk poppy seed cake and decorated it with daisies cut from fondant. When placed on a pedestal, it becomes a pretty centerpiece that gets compliments for its cuteness! For National Cake Decorating Day, try the tutorial for this lemon buttermilk poppy seed cake with fondant daisy flowers. 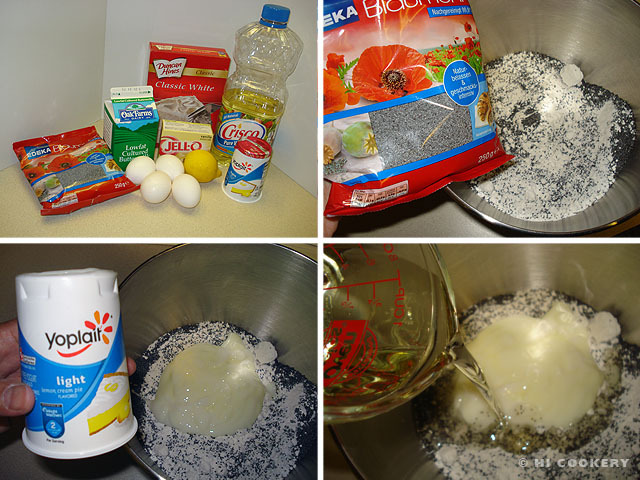 In a mixing bowl, combine the white cake mix, instant pudding mix, poppy seeds, yogurt and vegetable oil. 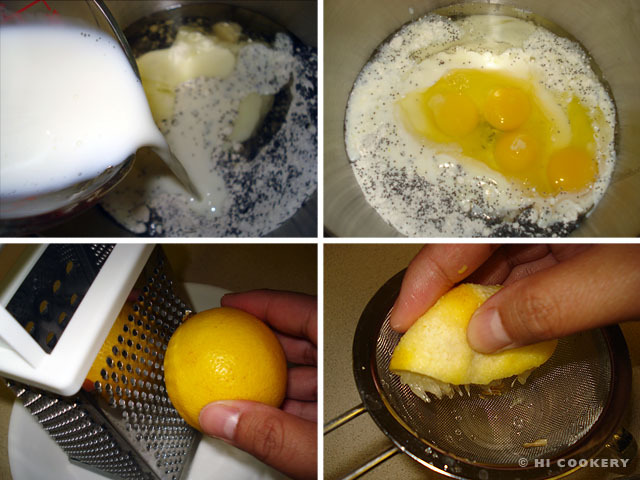 Add the buttermilk, eggs, lemon juice and zest. Mix well until the batter is smooth. Stir in the yellow food coloring (optional). Pour the batter into two 8-inch round greased cake pans. Bake at 350 degrees F for 45 minutes, testing the cake for doneness with a toothpick. Remove from the oven and cool the cakes completely. In a mixing bowl, cream the butter with a pinch of salt. Add the lemon zest and extract. 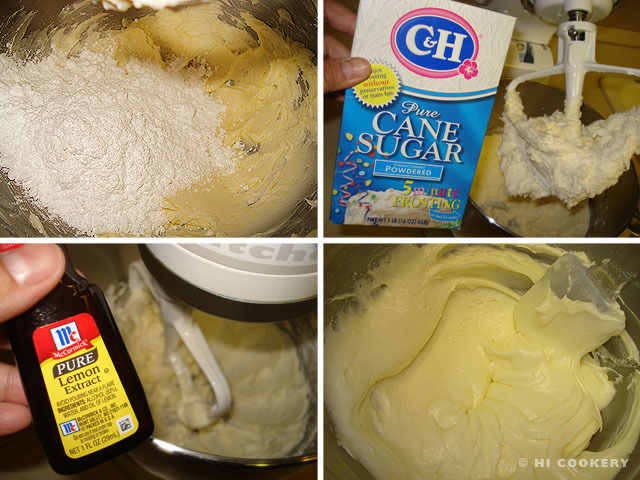 Gradually add the powdered sugar, mixing until smooth. Thin with lemon juice/water/milk to a spreadable consistency. 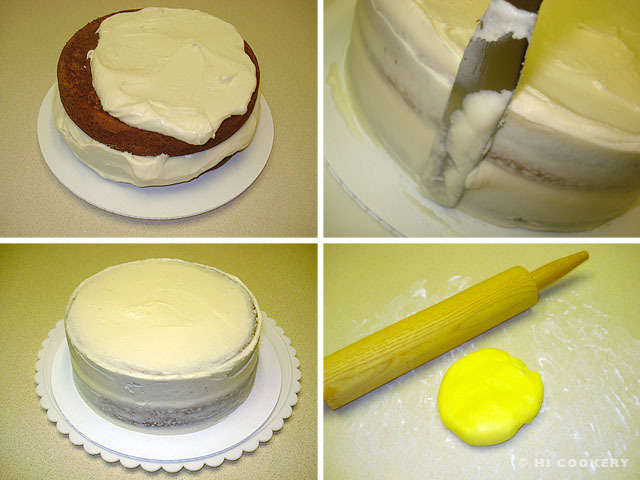 Smear a small amount of frosting on a cake board or plate to secure the bottom layer of the cake in place. Generously spread frosting on the cake. Place the other cake on top. 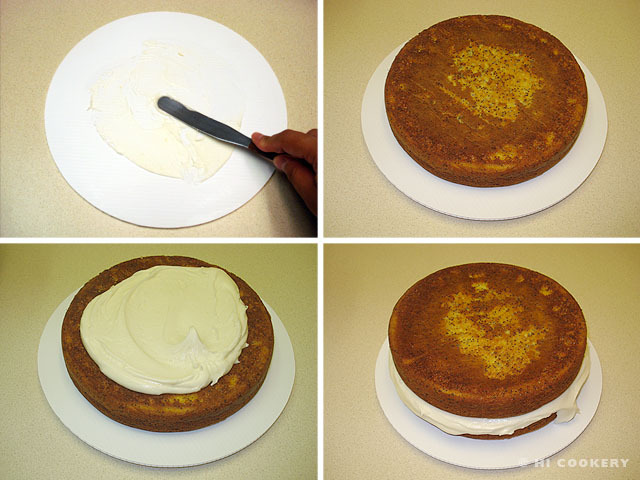 Spread frosting on the top layer and around the sides of the cake as a crumbcoat icing. Refrigerate for at least 30 minutes to set. Measure the height of the cake times two and add the eight inches (diameter of the cake) to determine the amount of fondant needed to cover it. On a surface that has been dusted with powdered sugar, roll out the yellow fondant larger than the measured amount to about 1/8 inch thick. 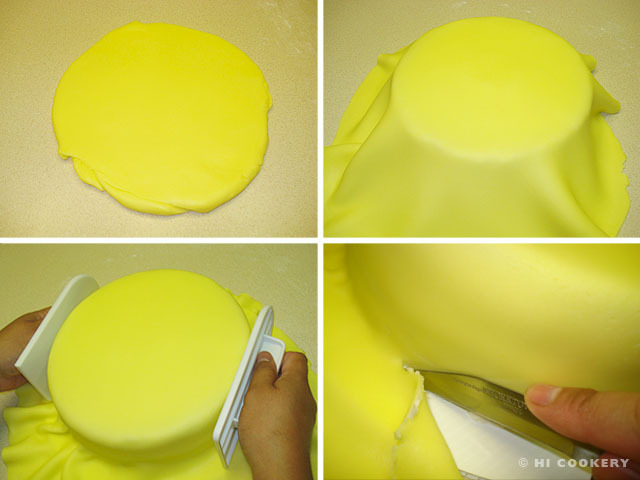 Carefully cover the cake with the fondant and smooth the top and sides (prick with a pin any air bubbles that remain). Slice excess fondant from the edge with a knife. 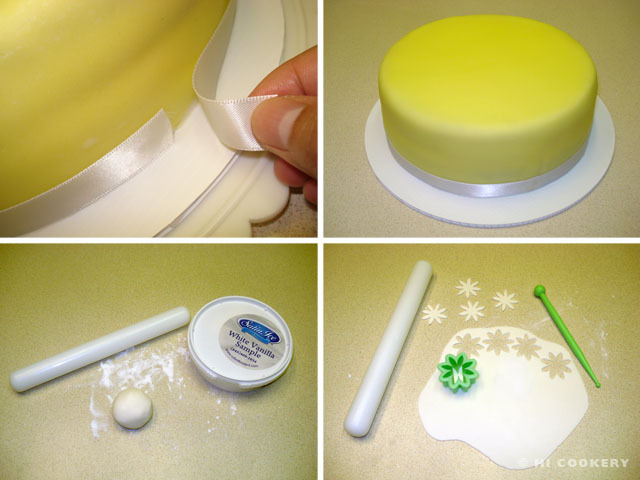 Trim with ribbon using a dot of icing to secure and overlap the ends. Box up the cake and refrigerate while making the fondant daisies. On a surface that has been dusted with powdered sugar, roll out white fondant to 1/8 inch thick. Cut out daisies. 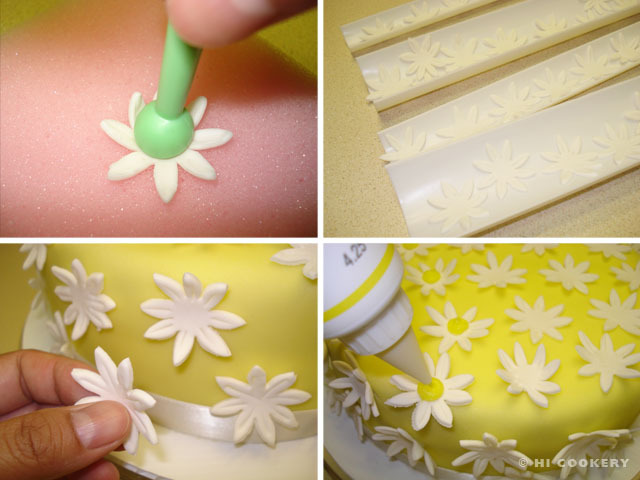 Place the cut fondant daisy on a foam pad and lightly press down the center with the ball tool. Use the edge of a dull knife to mark light lines on the petals to give the daisies some texture (optional). Place fondant daisies on flower formers and let dry for about 3 hours or overnight. 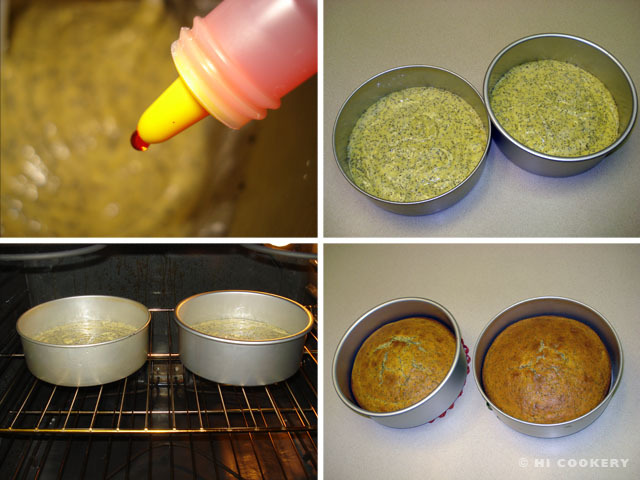 Use white icing with a round tip to randomly “glue” the daisies on the cake. Dot the centers of each daisy with yellow icing. Refrigerate the entire cake in a box and let come to room temperature about 30 minutes before serving. Place on a cake pedestal and display on a table (optional). 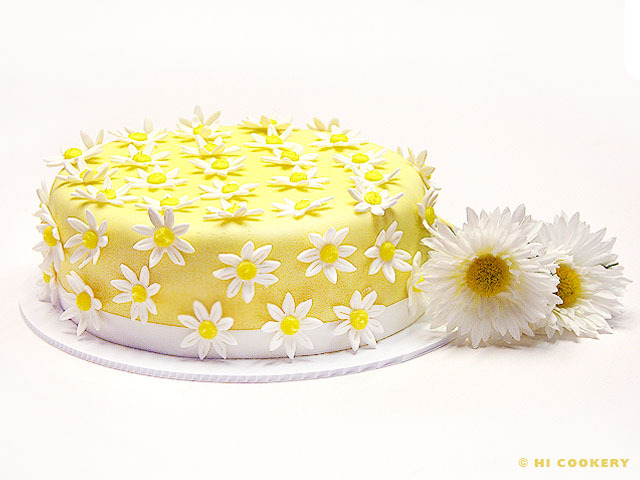 Although this yellow fondant-covered lemon cake with daisies design is more suitable for the spring season, subsitute it for chocolate fondant-covered spice cake with sunflowers (yellow fondant flowers with a chocolate center) for the fall. Cut the fondant daisies beforehand to allow time for drying. Fondant may be found at local craft stores and cake supply shops. Thanks to Lisa L. for the poppy seeds from Germany. Search our blog for more cake recipes. Awwww…thank you, Jennifer! Still learning how to improve my cake decorating skills. Your comment is encouraging! Did this cake taste good? Ive been asked to make a lemon poppy seed wedding cake with fondant and don’t know what it will taste or look like. The lemon poppy seed cake tasted good and moist. Poppy seeds leave black marks between teeth. LOL! Personally we don’t really like the taste of fondant (most people don’t either) but it’s pretty as decorations on a cake. At the weddings we attend, we see several guests remove the fondant and just eat their slice of cake. Good luck on your wedding cake project. Would love to see how it turned out.